Earn up to 8,200 reward points. Blues Harmonica set consisting of Seydel's top-level instrument, the model 1847 CLASSIC. Features a wooden comb and Seydel's best components. Comes with a soft case that accommodates up to 14 harmonicas. 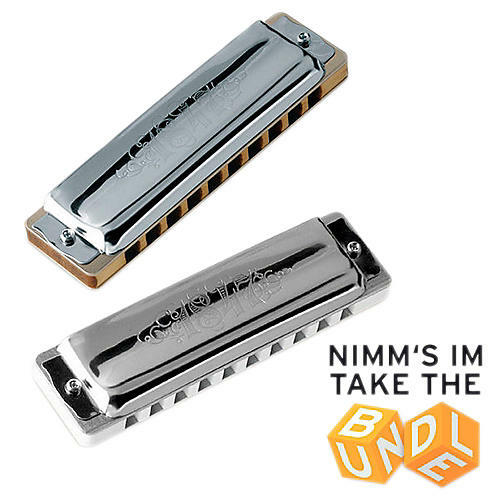 Twelve harmonicas are included in this set in the following keys: LC, LD, LF, LF#, G, A, Bb, C, D, Eb, E, F.
The 1847 is the first serial-produced Richter-diatonic harmonica with stainless steel reeds. It is a full and loud harp that is rich in overtones and has an extremely fast tone response due to the stainless steel reeds. They feature very long durability, even with heavy duty playing, again thanks to its stainless steel reeds and stainless steel rivets. You will experience less air-loss due to fine-cut reedplates, optimized flatness and extremely small tolerances between the reeds and the reedplates. It is beard- and lip-friendly thanks to its rounded coverplates and ergonomic hole openings and rounded dividers. The covers are made of extra strong stainless steel sheets (0.4mm) that are opened wide at the back and crimped, improving their stability. The 1847 is moisture-proof, and feature a swelling-free maple-comb that is sealed with multiple layers of food-grade finish. The 1847 is the result of Seydel's 160-year of experience in manufacturing high-quality harmonicas. Full set of twelve. Order today and be ready for anything.